Dawit Mesfin is well known in Eritrean circles as an author and political activist. He has just published a detailed and informative biography on the Woldeab Woldemariam – a teacher, journalist, trade unionist and politician who is often referred to as the father of Eritrea as an independent country. Published by Red Sea Press (where would we be without Kassahun Chekole and his colleagues?) it is an important addition to the growing historiography of Eritrea. Dawit is also one of the group who laid the foundations of resistance against President Isaias Afwerki’s regime when they signed the document that is today known as the ‘Berlin Manifesto’. The men and women who came together on 3 October 2000 raised all the issues of human rights that Eritrea so sadly lacks. In May 2001 a similar statement was signed by Eritreans known as the G15, many of whom were promptly arrested and have remained imprisoned in Eritrea without trail ever since. Dawit’s role in all this is known and he remains active in Eritrean politics, continuing to call for the freedoms that his countrymen and women so badly need. So what is his secret? It is this: Dawit has an illustrious father. Indeed, his dad, Mesfen Tesfaye could be called the father of Eritrea’s favourite sport: cycling. 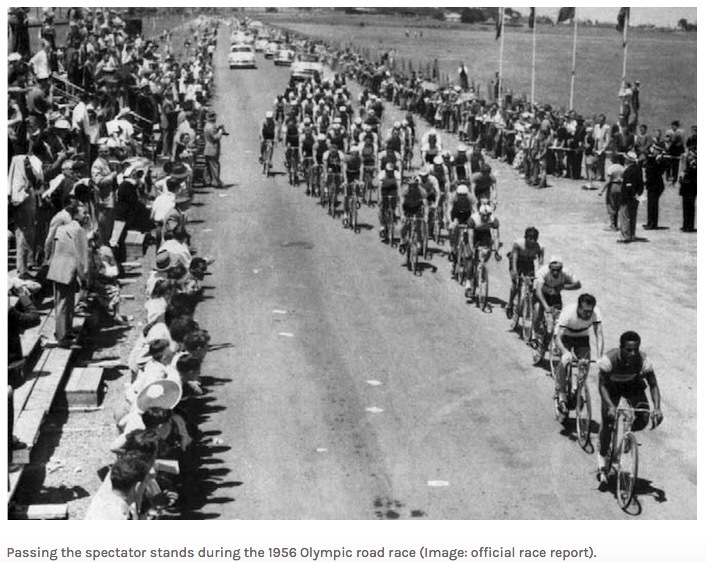 Mesfen competed in the 1956 Olympics in Melbourne – representing Ethiopia, of which Eritrea was then a part. It was the first occasion on which Ethiopia participated in the Olympics and Mesfen competed in both the individual and team events. They were the first black African team ever to participate in the Olympic Games. Mesfen participated in the team road race with Guremu Demboba and Zehaye Bahta — winning 99 points and taking the 9th place. Dawit remembers his father running a cycle shop near Kagnew station (the US base in Asmara.) His parents sadly separated, with Dawit’s mother living in Italy with her son. But Dawit does recall meeting his father in 1968, training the Ethiopian cycling team that participated in the Mexico Olympics of that year. Later they met on the streets of Addis Ababa in 1975, as Mesfen was urging on Eritrean cyclists, who were competing to qualify for the 1976 Olympics in Montreal. Mesfen had brought the Eritrean team to Addis. Mesfen was an inspiration to young Eritreans, who so loved their sport. Among them – “Gigante” Tekeste Weldu and Salambini Carmelo – who remembered him well.